Everyday we are getting closer and closer to one of the most cheerful winter festivals and that’s why today, we are going to teach you how to crochet one of the most beloved symbols of Christmas – Rudy, the reindeer/baby booties. There is no doubt Rudy is the cutest character of all time and this is probably a reason we have chosen it for our Christmas projects collection. If you love Rudy the reindeer/baby booties as much as I do, then it is time to start learning how to make them in the best possible ways. Just watch the tutorials very carefully, follow the patterns and try to make every single stitch according to the easy instructions. We wish you a good luck and joy with these lovely projects. Please, enjoy your crochet and Christmas time and of course, do not forget to share your experience with your friends and family members. Good luck and happy holidays. Who doesn’t need a pair of cute festive reindeer booties for the season?! Simple to make, they are the perfect gift and a great little project for using up your yarn stash too. 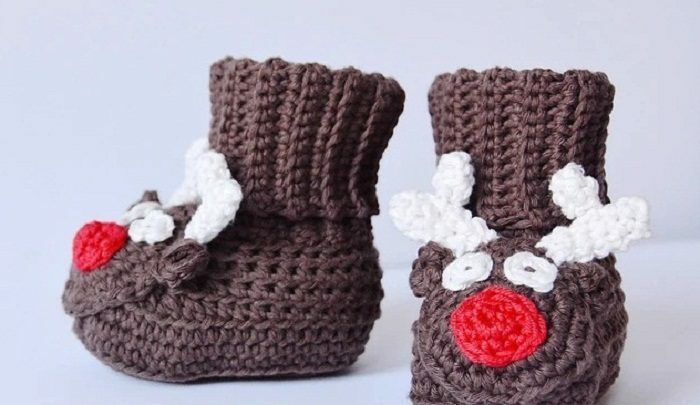 This is one more beautiful design for the reindeer baby booties and a very helpful and easy to follow crochet tutorial for it. Hope you’ll enjoy making these lovely booties. Good luck and happy crocheting.